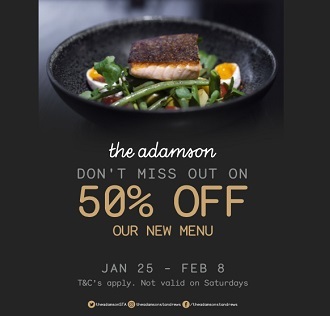 We are delighted to announce our new Winter 2019 Main Menu & offer 50% OFF this menu from January 25th – February 8th 2019. Our team have been hard at work to bring a fresh new feel to your dining experience, including scallops: jerusalem artichoke puree, apple & truffle jus, chicken: creamed spinach, courgette, parmesan gnocchi & turnip & rice pudding: apple compote, golden raisins & macadamia nut crumble. T&Cs apply to this offer – advance bookings only, not valid on Saturdays and excluding the Grill section. Please quote ADAM50 when making a booking.